These are a diverse mix of free, freemuim and some paid marketing tools used by most startups and entrepreneurs, one of the enjoyable aspects of working in digital marketing today is finding useful tools that help other entrepreneurs grow by finding the right growth tools. Offerpop is an engagement marketing platform with a focus on garnering engagement via user-generated content, hashtag campaigns, referral programs, quizzes, contests, and more. They’re focused on transforming the way that global brands engage and convert today’s mobile and social consumers. 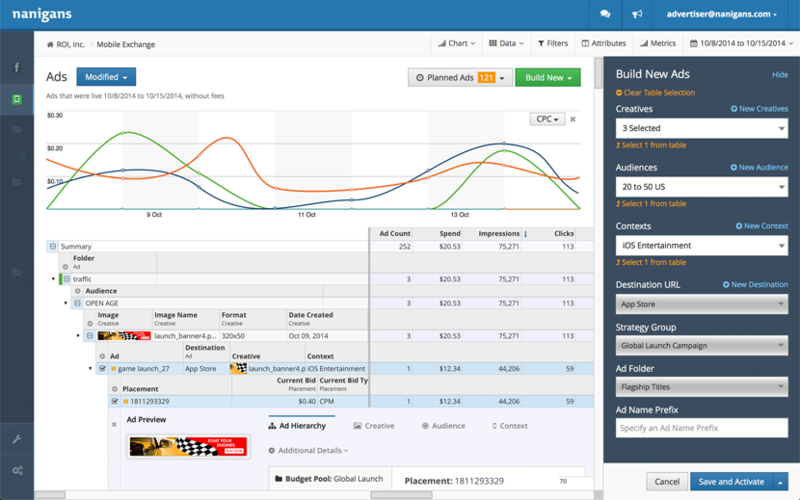 Nanigans is a multi-channel advertising software with an emphasis on Facebook marketing. Its software has access to the Facebook Exchange (FBX) for re-targeting and a plethora of other tools that make targeting more efficient. Nanigans is the tool of choice for companies such as eBay, JackThreads and Zynga. The Power Editor is Facebook’s own tool for creating and running advertising campaigns. Facebook is constantly improving its ad platform, and the tool frequently releases new targeting and budgeting features for users. For marketers just starting on the paid social front, this is probably the best choice as there is no third-party fee to create and manage your advertisements. AdRoll is one of the most well known names in the re-targeting space, boasting a customer base of over 20,000 brands. Its platform grants access to over 500 ad exchanges, which includes most of the major social media networks. It offers a self-service platform, but you can also leverage its employees for additional help if you need it. ReTargeter is a tool that uses site re-targeting, search re-targeting and dynamic re-targeting. You can use ReTargeter as a self-service platform, or you can pass all of your campaigns onto an account team to run your re-targeting for you. You can use these search services or combine several into a custom package. Chango is an award-winning display advertising platform with robust re-targeting features. With Chango you can combine your own re-targeting information with audience intent data that Chango accumulates, which adds a second layer of targeting to your campaigns. Rocket Fuel is a popular tool with a feature called Moment Scoring. Moment Scoring uses anonymous user data to calculate how likely someone is to respond to your advertisement, then uses that information to decide when and where to serve your ads. Rocket Fuel offers both a self-service platform and managed services. Simpli.fi differentiates itself by being able to take complete advantage of unstructured audience data. This means that–unlike some other tools on the market–Simpli.fi doesn’t need to rely on pre-made audience segments to categorize audience data, which can be a big advantage when working with a lot of data. Maxymiser is a tool that goes beyond landing page testing. This enterprise-level software solution was built to test all sorts of portions of your website, and to run several different tests all at once. Maxymiser also allows you to segment who you want to send to each tests, creating a more catered experience for your website visitors. We’ve worked with Wistia on content in the past, and the company is such a fantastic group of individuals. Not only does the team rock, but the platform is amazing for business looking to host, customize and share videos across the web. One of the best functions of its platform is the ability to include a custom CTA at the end of each individual video, making it easy to drive viewers to specific pages. A great way to make sure your online content stands out is to include an image, but sourcing images that satiate the unique requirements for each social network can be tough. We aimed to solve that problem with our new social media image re-sizing tool Landscape. Quickly turn one image into multiple, each perfectly sized for the social media networks you’re using.